Are you familiar with patronyimic naming? It’s when the father’s first name becomes part of the child’s last name, so the surname changes with each new generation. For example, Olaf Gunderson’s son would be Eric Olafson. Eric Olafson’s son would be Jen Ericson, and so on. This is also true for daughters, where Olaf Gunderson’s daughter would be Hannah Olafsdottr. So as genealogists, we all cringe at this, because when you have maybe 25 names that are the common first names, combine them with other first names and you have a bazillion people with the same name who are completely unrelated. And how do you know if Ranghild Ericsdottr is related to someone living nearby who is Jen Ericson? It’s enough to give you a migraine just thinking about it. Until you dig a little deeper. Then it gets easier…and harder. Here’s why. 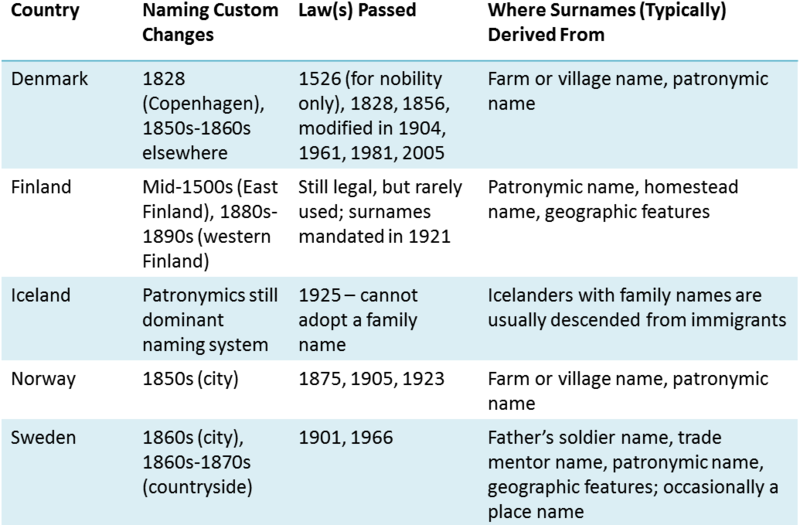 The truth is yes, patronymic naming is the traditional thing in Scandinavian countries – and specifically here I’m referring to Denmark, Norway, Sweden, Finland and Iceland, also sometimes referred to as Nordic countries. But during the mid-1800s to mid-1900s in many countries it became stylish to adopt a hereditary surname – the kind that doesn’t change with each generation. Eventually governments started adopting laws that required families to take on hereditary surnames. Of course, the laws were enforced to varying degrees, and in some places they had to pass the law multiple times to really get the message across that “We’re serious this time. Pick a name.” Then people sometimes chose names from the farms they lived at – which they may or may not have owned. So with different families adopting hereditary surnames at different times, selecting the surnames in different ways, and the laws in each of these countries being passed at different times (or multiple times), it gets easier to trace the families in the 1900s (mostly), but then it gets really tricky in the early 1900s and 1800s when everything was in flux. To help you out, here is a quick cheat sheet to help you keep it all straight…or as straight as possible. Enjoy! I love this! Thanks so much. The chart makes it so much clearer. I have some German/Prussian/Dutch relatives that are SO hard to chase, but the naming explanation makes me feel better about being so confused! This entry was posted on 5 August 14 by KC Reid in Tools n Tips and tagged ancestry, denmark, Father, finland, iceland, names, norway, scandinavia, sweden.